Thanks to the best customers, clients, agents and support staff in the business, BHHS recorded another record-breaking year for real estate sales in Lee County – more than doubling the sales volume of the next closest real estate competitor. 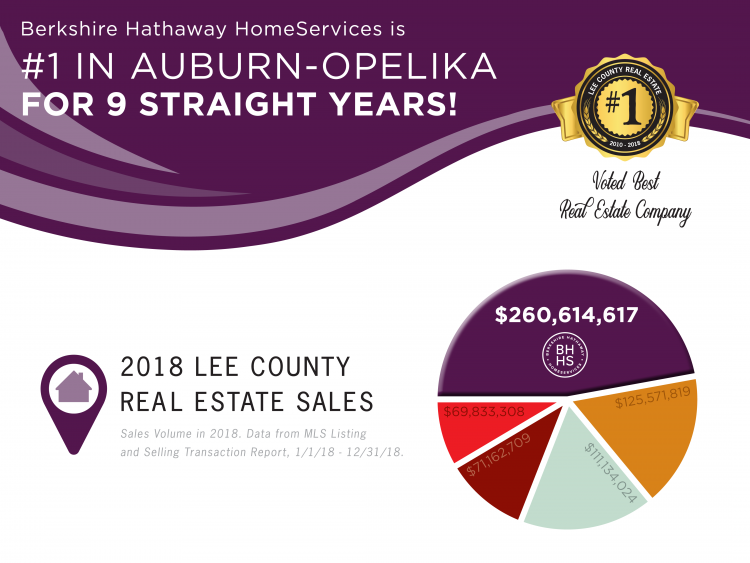 According to the Alabama Center for Real Estate, residential sales in Lee County were up 12.7% over 2017 and Berkshire Hathaway HomeServices garnered the largest portion of the increase with over $260 million in local sales. The Auburn-Opelika market remained extremely active throughout 2018 with a new low of only 62 days on the market for residential. BHHS' large agent network and speed-to-market capabilities helped listing clients receive the best price in the shortest window and placed buyers in their new homes faster than any year in history. In a move indicative of the fast-paced market, the average sale price was at it's highest level in recorded history in 2018 at $258,441. BHHS Preferred Real Estate has set their sights on new goals for 2019 and continue to support the local community through philanthropic and community service activities via their #BHHSInvolved initiative. Berkshire Hathaway was also named "Official Real Estate Partner of the Auburn Tigers" in 2018 and remains active in supporting all Auburn University sports. To find out more about putting the power of Auburn-Opelika's #1 real estate company to work for YOU get in touch at (334) 826-1010 or connect via Facebook, Instagram and Twitter.